Our next exhibition is by Derek King, who continues his exploration into the abstract colours and shapes of his environment. This body of work concentrates on the Marine Lake at West Kirby and is sure to surprise and please the eye. The Exhibition opens on Friday 1st of June and will run throughout the month. Join us on the OPEN EVENING, Friday 4th May. 7:30pm to 9:30pm. Come and see the latest exhibition of work by Wirral based artist Carol Emmas. This stunning collection crosses the boundaries of photography and art with ease, resulting in imagery that is balanced yet questioning. New addition to our ceramic collection is the fantastic geometric, sculptural, works by Janet Halligan. These little gems are sure to put a smile on the faces of those receiving them as gifts. 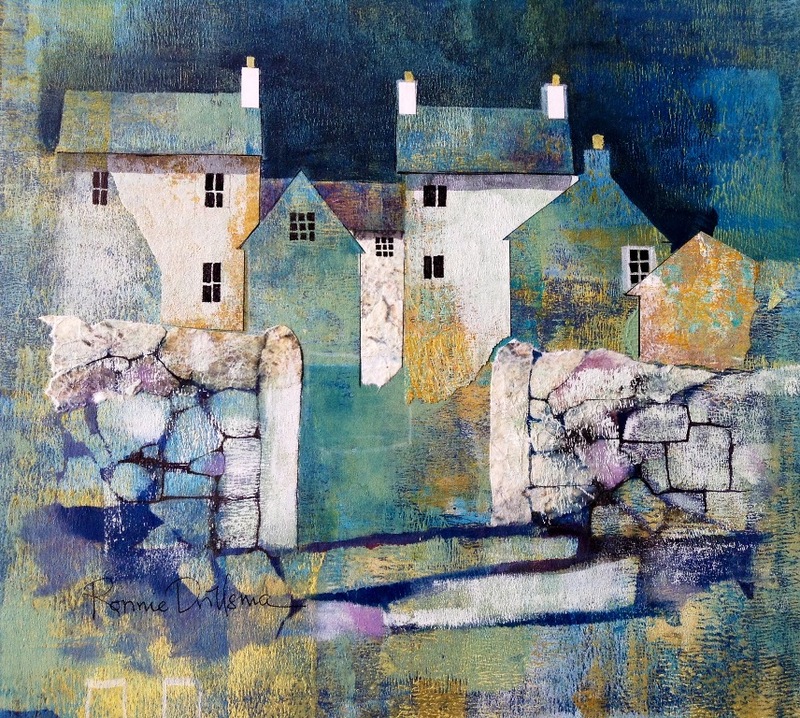 Come along and enjoy the latest work by Elaine Adams, meet the artist and have a glass with us. This stunning work explores the colour and light of our ever changing shorelines and is captured beautifully through the use of textiles. Whilst the cold weather takes a hold we can at least look forward to the stunning, bright and engaging work by Elaine Adams. Starting on the 1st March 2018, this new body of work will be on show throughout the month. We were very excited to welcome this months artist Priscilla Fursdon to Staacks. "Colour is the only direction"
February sees a sensational collection of original prints by local artist Priscilla Fursdon. Inspired by Patrick Heron, the work is an exploration of colour and the inter-relationship between the inks, the colours themselves and their application. Now 90 years old, Priscilla has ventured into ceramics, painting and printing and we are proud to host this exhibition that focuses on her printing from 2000 to date. This month we have a collection that includes works by Jane Morrow, Sherilyn Halligan and Fiona Phillipps. This is supported by some fab photography by Claire Bates and some surprises from Peter Macaulay. The new exhibition by Gill Wyche, "A Moment, Still.." opened to a capacity crowd on the open evening with everyone praising Gill's work with great enthusiasm. Up until the end of the month it is well worth a visit. We are very pleased to introduce Ceramix17, our new exhibition of selected ceramicists, including Simon Shaw, Lindi Martin, Rebecca Parrin, Sarah Nicol, Janet Holmes and Ritchie"the Potter". We are excited to once again host an exhibition of work by Ronnie Drillsma. Autumn Light is a collection that reflects her interest in the seasonal changes in colour and light, executed in an adventurous and exploratory way that delivers an engaging yet intriguing narrative. We are very excited to welcome back Jane Morrow and her latest body of work, "Between Tides". Showing throughout September, this popular style and local subject matter is once again going to be a big hit with our customers. We spent a great few hours walking through the fantastic display of modern sculpture at Chester Cathedral. Go visit before it ends in October. Very pleased to say that the latest body of work by Clare went down well and was very well received. We now look forward to working with Clare in future group and solo shows. The latest exhibition is proving very popular and continues to sell well. It never fails to get the adrenalin going when another sale goes to a good home. Things are now shaping up for the next exhibition with new publicity and images filtering through. Watch this space!! !